ConsCould be tighter against the body. Easy to install and looks as good as the picture shows. Took 10 minutes to install. Very easy and the look gives a great finish to my Jeep Shara. it seems harder than it actually is.just take your time and line everything up. it is pretty simple. I bought this to keep sand away from the fuel cap. This door is a nice addition to the Jeep! Fit good, easy to install and top guality. .
Nice cover and completes the area that should have been equipped with. Also, Just for Jeeps was very good and prompt on giving me credit on a return I made. Could not have been better. Enabled me to make this purchase sooner. Will go to them first. ProsGreat products and outstanding service. When I receive the fuel filler door I noticed it was not the same as pictured. Still it didnt look too bad. And yes it was easy to install. After installing I noticed it didnt really fit tight. There was no Mopar markings on the product just numbers. Great quality. Took 10 minutes to install. Here's the tip. Install the gasket on the new cover opening first. Then put a small amount of silicone grease on the gas tank nozzle and some on the inside of the gasket itself. It'll slide right on with no effort. ConsMaybe a little more then others but I think it was worth getting the Mopar. Took me literally 5 minutes to do it all. Looks really nice. Only took about 15 minutes to install. Hardest part was getting old one off. 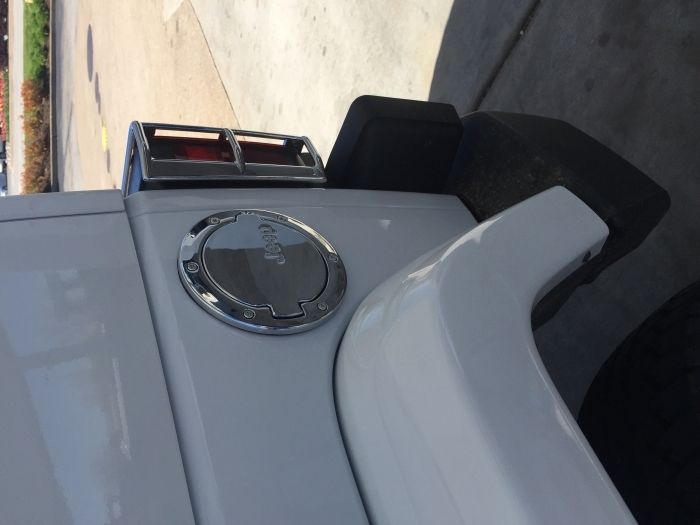 Hard to get to locking tabs toward the front of jeep with the fender structures in the way. Still not too bad. Easy to install myself and looks great! 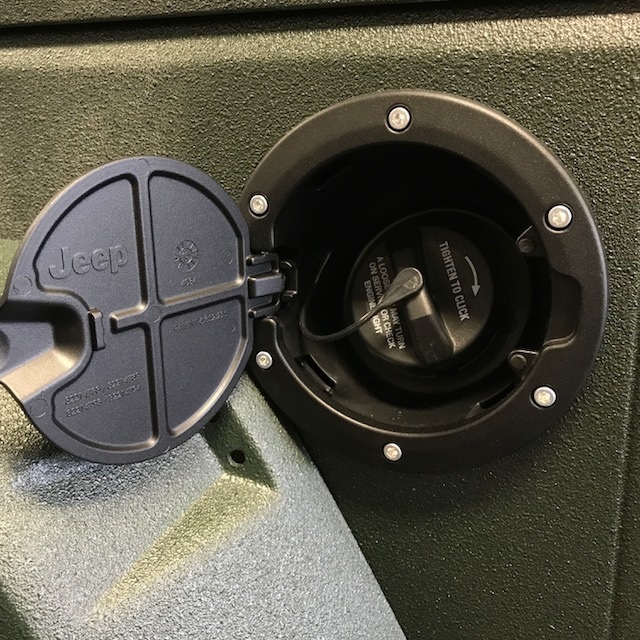 I have a brand new 2016 Sahara Unlimited and it had the standard fuel cap. My husband has a black Sahara it it came with the chrome fuel door. My Jeep felt "naked" without one! It came quickly, was fairly easy to install (the rubber gasket took some coaxing), and looks great! Awesome product. Easy installation took about 15 minutes. The included instructions are a little vague as they are only pictorial and not exactly representative of the newer models. But there are several YouTube videos that demonstrate the installation quite effectively. After viewing those, the included instructions were a little easier to understand. Good product, great look. ConsIncluded instructions could use some textual description. Item arrived in good condition, easy instructions to follow for installation, have not had time to install but hope to in the next few days. Purchased item to help keep snow and ice from accumulating around the fuel filler cap. Easy to install. Fits nicely. Could use two more snaps to hold tighter against the body. Nice touch with Jeep written on the outside. ProsNice looking. Great on black. No lock which is great. ConsCould fit a little tighter to body. 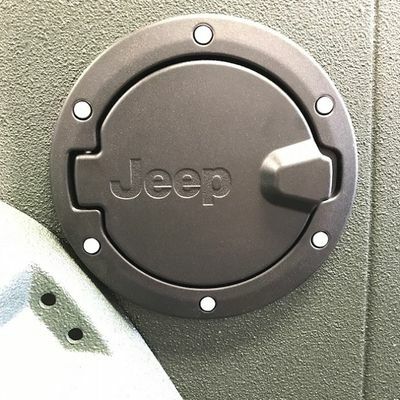 This was a simple and quick install and it looks great on my 2015 Jeep Wrangler Sahara. 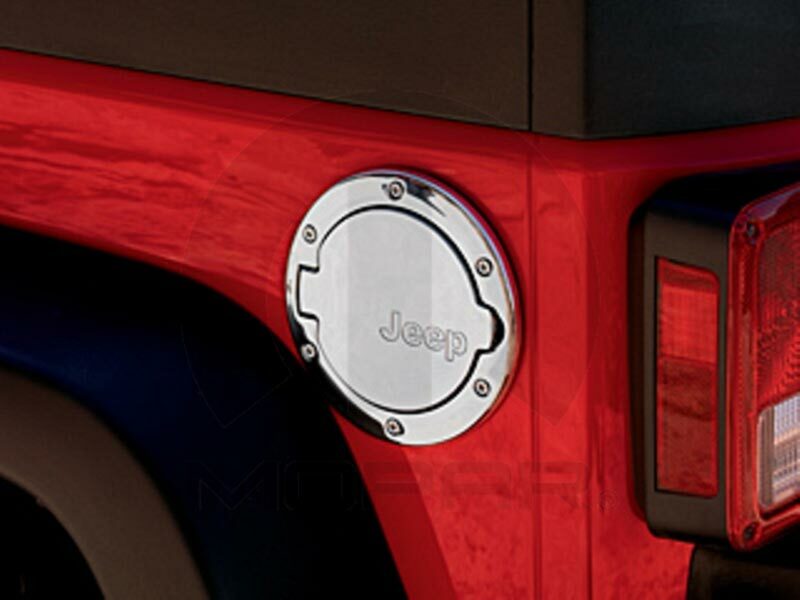 Great place to shop for Jeep accessories. Bought the fuel door to replace a missing part on our Wrangler. It arrived very fast & was simple to install. Thanks again Just for Jeeps for a great product! Will continue to shop here for my jeep accessories!